I was downloading pics off my phone a few days ago, and came across this snapshot from a few weekends ago. John and I brought a blanket to the park, listened to music nestled in the shade of a Live Oak tree, and daydreamed. After a while, the sun peeked out from behind the leafy greens and shone bright in my face. I squinted my eyes tight, let the smile spread across my face, and just felt content. Happy. 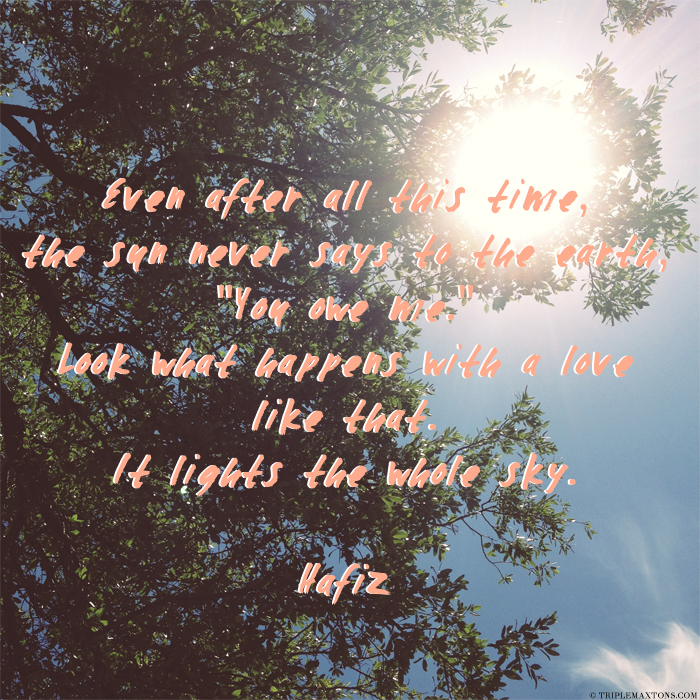 One of my most favorite quotes in the whole wide world came to mind, with me sprawled out in the sunshine with my husband laying next to me. I snapped this pic so I could remember that moment. Now I'm sharing it with you because this quote is a shining example of how to love....and how we all dream of being loved in return. Just beautiful. Also...this might be one of the corniest posts I have ever written. when there is love nothing else matters. this was lovely. Maybe corny, but a nice sentiment!